1. Write your testimony in Books of Mormon and deliver them to friends and/or give them to the missionaries to hand out to investigators. 3. Write a song or poem that represents your testimony. 4. Create a work of art, video, collage, etc. that depicts your faith. 5. Make a quiet-book with pictures of Christ to help a child focus on the Savior during the Sacrament. 6. Be a news reporter for a day and interview someone whose faith you admire. Edit a video or write a transcript of the interview. 7. Write about a time your faith was strengthened and submit the article to the New Era. 8. Learn how to bake bread and donate a batch for use in Sacrament meeting. 9. Bear your testimony through music by volunteering to play hymns at your local hospital or nursing home. 10. Plan and carry out an activity such as New Beginnings or Young Women in Excellence. 12. Choose a favorite scripture hero and prepare/present a Family Home Evening lesson about how their faith helped them fulfill their divine role. 13. Learn about the faith-filled lives of early Pioneers by watching 17 Miracles, reading stories from General Conference, or by using the Family Search Pioneer Ancestor Search Tool. Record how their examples can help you have strength to carry on. 15. Strengthen your faith in the atonement by memorizing the words to your favorite sacrament songs, The Living Christ, or a compilation of scripture verses about the Savior. 16. Conduct the music or play the organ during the the sacrament hymns for one month. 17. Exercise your faith by overcoming one of your fears. Get better at talking to people, take swimming lessons, or even intern at a local dentist office. (Am I the only one who's afraid of his pointy drills?) Note: Be sure to seek counsel from your parents/leaders to ensure you don't do anything too dangerous. 18. Make hair bows, flower clips, embroidered towels, bowties, scripture bookmarks, or other small gifts for the Primary Presidency to give to the children being baptized in your ward. 19. Sew a baptism dress for a sibling, convert, or child in need. 20. Prepare to share your faith with others by going on splits with the Sister missionaries and studying Preach My Gospel. 21. Share your faith with others by participating in a missionary related activity such as hosting the missionary discussions in your home, assisting with an open house, or organizing a seminary social. 22. Read Alma 32 and learn about how faith is like a seed. Explore this principle by researching, planning, and planting a garden, flowerbed, tree, etc. for yourself or someone in need. 25. With permission from your bishopric, decorate one of the bulletin boards in your meetinghouse with inspiring messages about faith in Jesus Christ. 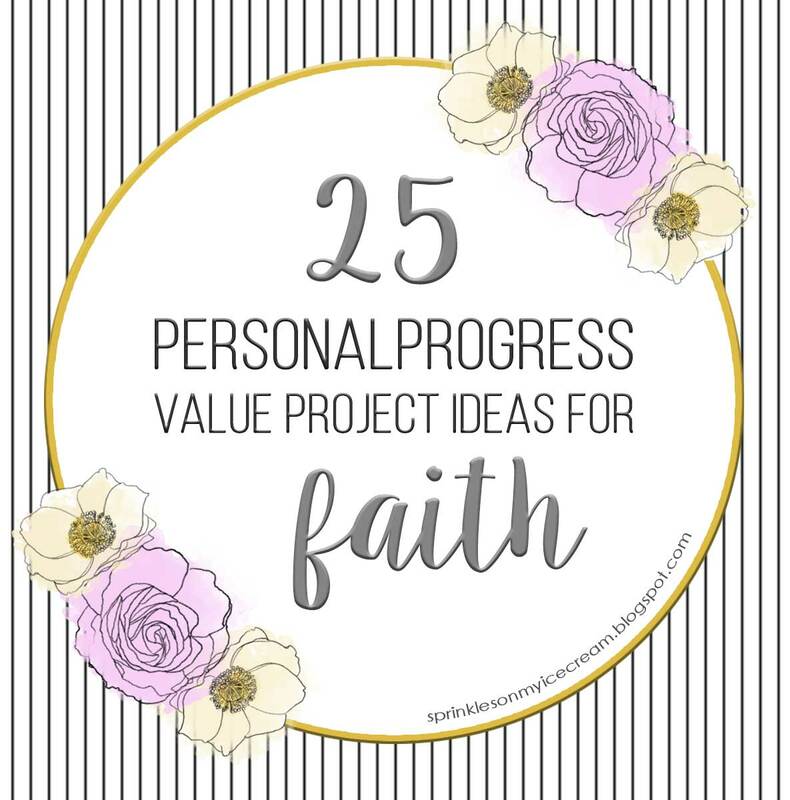 What ideas do you have for Faith value projects? Such great ideas! I ABSOLUTELY LOVE THE NEW DESIGN! The old one was also cute but I love the new colors and it all looks so professional (but still fun... does that make sense?) Did you do it yourself?!? Some tutorials would be awesome;) It looks amazing!!! Hope you are having a great day! I hope you are having a fabulous day, too!